Dragon boat racing is the most popular activity in the Dragon Boat Festival. Dragon Boat Festival, also known as Duanwu Festival, is a traditional and important celebration in China. Dragon Boat Festival 2019 falls on June 7 (Friday). 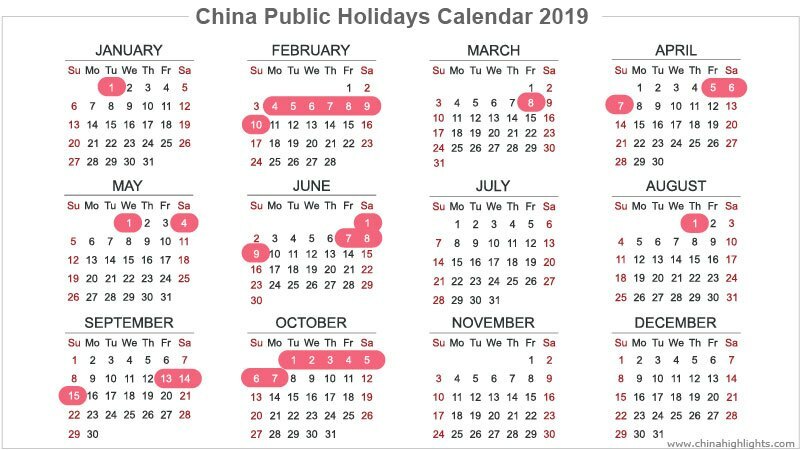 China will have 3 days of holiday from Friday (June 7) to Sunday (June 9), and we will be back at work on Monday , June 10. The Dragon Boat Festival date is based on the lunar calendar, therefore the date varies from year to year on the Gregorian calendar. 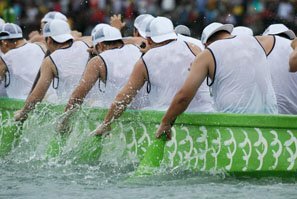 What Is China&apos;s Dragon Boat Festival? It&apos;s a traditional festival full of traditions and superstitions, maybe originating from dragon worship; an event on the sporting calendar; and a day of remembrance/worship for Qu Yuan, Wu Zixu, and Cao E.
The festival has long been a traditional holiday in China. On May 20th 2006 it was selected into the first batch of National Intangible Cultural Heritage items. In 2008 it was first celebrated as a public holiday in China. On October 30th 2009 it was added to the UNESCO World Intangible Cultural Heritage List. Why Dragon Boat Racing is Held for the Day? Dragon boat racing is said to originate from the legend of people paddling out on boats to seek the body of patriotic poet Qu Yuan (343–278 BC), who drowned himself in a River. Dragon boat racing is the most important activity during the Dragon Boat Festival. 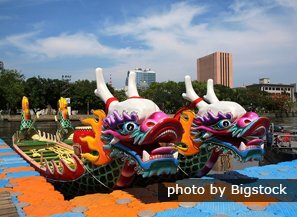 The wooden boats are shaped and decorated in the form of a Chinese dragon. The boat size varies by region. Generally it is about 20–35 meters in length and needs 30–60 people to paddle it. During the races, dragon boat teams paddle harmoniously and hurriedly, accompanied by the sound of beating drums. It is said that the winning team will have good luck and a happy life in the following year. Dragon boat racing has become an important competitive sport. Many places in China hold dragon boat races during the festival. Here we recommend the four most ceremonious places. 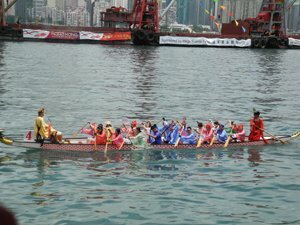 A dragon boat in the Hong Kong Dragon Boat Festival. 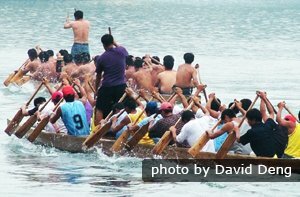 Read more about Dragon Boat Racing. Duanwu Festival(Dragon Boat Festival) is a folk festival celebrated for over 2,000 years, when Chinese people practice various customs thought to dispel disease, and invoke good health. Some of the most traditional customs include dragon boat racing, eating sticky rice dumplings (zongzi), hanging Chinese mugwort and calumus, drinking realgar wine, and wearing perfume pouches. 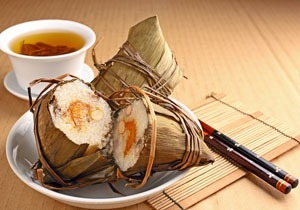 Zongzi (粽子zòngzi /dzong-dzuh/) is the most traditional Dragon Boat Festival food. It is related to Qu Yuan commemoration, as the legend says that lumps of rice were thrown into the river to stop fish eating his drowned body. They are a kind of sticky rice dumpling made of glutinous rice filled with meats, beans, and other fillings. 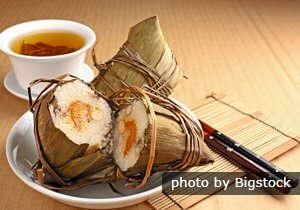 Zongzi is wrapped in triangle or rectangle shapes in bamboo or reed leaves, and tied with soaked stalks or colorful silky cords. The flavors of zongzi are usually different from one region to another across China. Read more on Zongzi. There is an old saying: &apos;Drinking realgar wine drives diseases and evils away!&apos; Realgar wine is a Chinese alcoholic drink consisting of fermented cereals and powdered realgar. In ancient times, people believed that realgar was an antidote for all poisons, and effective for killing insects and driving away evil spirits. So everyone would drink some realgar wine during Duanwu Festival. Learn more about Dragon Boat Festival Food. Before Dragon Boat Festival arrives, parents usually prepare perfume pouches for their children. They sew little bags with colorful silk cloth, fill the bags with perfumes or herbal medicines, and then string them with silk threads. 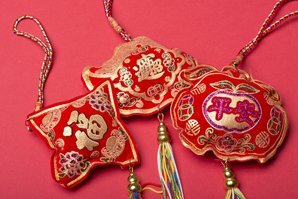 During Dragon Boat Festival perfume pouches are hung around kids&apos; necks or tied to the front of a garment as an ornament. The perfume pouches are said to protect them from evil. The Dragon Boat Festival is held at the start of summer, when diseases are more prevalent. 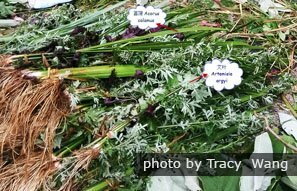 Mugwort leaves are used medicinally in China. Their fragrance is very pleasant, deterring flies and mosquitoes. Calamus an aquatic plant that has similar effects. On the fifth day of the fifth month, people usually clean their houses, courtyards, and hang mugwort and calamus on doors lintels to discourage diseases. It is also said hanging mugwort and calamus can bring good luck to the family. 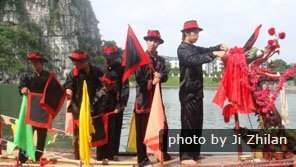 Learn more about Dragon Boat Festival Customs. How Did Dragon Boat Festival Start? There are many legends about the origin of the Dragon Boat Festival. The most popular one is in commemoration of Qu Yuan. Competitors are paddling hard in a dragon boat race. Qu Yuan (340–278 BC) was a patriotic poet and exiled official during the Warring States Period of ancient China. He drowned himself in the Miluo River on the 5th day of the 5th Chinese lunar month, when his beloved Chu State fell to the State of Qin. Local people desperately tried to save Qu Yuan or recover his body, to no avail. In order to commemorate Qu Yuan, every fifth day of the fifth lunar month people beat drums and paddle out in boats on the river as they once did to keep fish and evil spirits away from his body. Learn more about The History and Legends of the Dragon Boat Festival. Many Chinese people will make use of the 3-day holiday to go traveling. Therefore, during the Dragon Festival, most attractions will be crowded, cheap public transport (like buses and trains) may be sold out, and accommodation may be slightly more expensive. 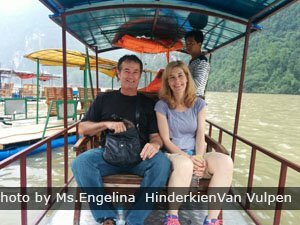 Contact us and we can help you avoid the hassles, and have a China experience that includes the best of the Dragon Boat Festival.